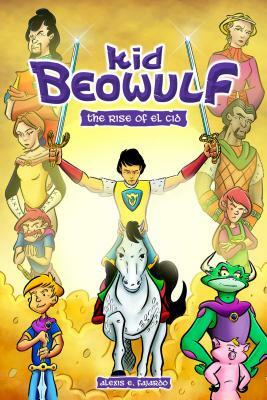 Kid Beowulf: The Rise of El Cid (Paperback) | Copperfield’s Books Inc.
"This book is the perfect example of the power of graphic novels as meaningful literature that deserve a place in every classroom." The third volume in the Kid Beowulf series by Alexis E. Fajardo is an action-adventure swashbuckler with a dash of romance set in medieval Spain. Based on the Spanish national epic, El Cid, Kid Beowulf: The Rise of El Cid picks up shortly after the events of book two. Beowulf and Grendel are in war-torn Spain, where honor is hard-fought, allegiances are dubious, and the bulls run wild. Amidst it all comes a young knight named Rodrigo, who fights for the name he’s lost, the land he loves, and the virtue they’ve both forgotten. It continues the Kid Beowulf narrative and gives Beowulf and Grendel new characters to meet and lessons to learn. Alexis E. Fajardo is a student of the classics—whether Daffy Duck or Damocles—and has created a unique blend of the two with Kid Beowulf. When he's not drawing comics, he works for them at the Charles M. Schulz Studio in Santa Rosa, California. Lex does not live in a castle but would like to one day with his wife and his dog, Loki.